I am reading about low carb / no carb diets all over the blogasphere and somewhere, something seems to have been lost in translation. In my opinion, a healthy diet will consist of about 55% carbohydrate consumption. These healthy carbohydrate choices can be found in whole grain breads, brown rice, fruit and vegetables, popcorn, nuts, seeds, low fat / non fat milk and yoghurt, dried peas / beans. There is a difference between starchy carbohydrates i.e. cassava, corn, hominy, parsnips, peas, plantain, potatoes, pumpkin, spaghetti, winter squash, succotash, yam and sweet potato which give 80 calories per 1 cup raw serving and add 15g of carbohydrates to your diet, and non starchy carbohydrates. These non starchy carbohydrates include amaranth, Chinese cabbage, artichokes, asparagus, baby corn, bamboo shoots, beans, bean sprouts, beets, broccoli, Brussels sprouts, cabbage, carrots, cauliflower, celery, chayote, eggplant, gourds, scallions, collard greens, kale, tyurnip, hearts of palm, jicama, kohlrabi, leeks, mushrooms, okra, onions, daikon, pea pods, peppers, radishes, rutabaga, spinach, summer squash, zucchini, sugar snap peas and Swiss chard and give 25 calories per 1 cup raw serving and add 5g of carbohydrates. The key to a healthy diet is to have carbohydrates with each meal, aiming for a minimum of 175g per day, and for me personally, I restrict our starchy carbohydrates at night. To kick start your metabolism in the morning do not overload your breakfast with carbohydrates. With this in mind, I made these potato and butternut latkes to have with our lunch one Sunday. The recipe came from a feta booklet published by Fairview Cheese, which is a local farm, close to where I live. Do not keep the mixture for another day! It must be used as soon as possible after making it. You can keep it in the fridge for a few hours if necessary. 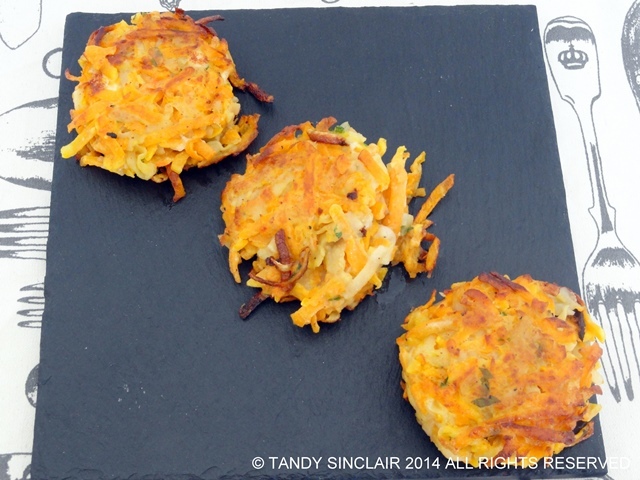 These latkes look really pretty, Tandy..and I love the color from the butternut squash.. These look amazing, Tandy! Love the recipe! Mmmm… these look incredible! See, now this is why I also want to do a nutrition course – there’s so many mixed pieces of info out there. Last year I went on a silly diet of eating only carbs for breakfast and then a lentil salad for lunch and chicken/lean meat and veg for supper. Worked really well and I lost weight and had tons more energy. But then I realised I was losing too much weight, so now I just eat what I feel my body needs during the day and it’s working out much better. Gotta try these! I think eating what your body craves works wonders if you keep to the moderation thing! The combination of butternut and potatoes sounds great. Your latkes look crisp and delicious. thanks for sharing this info, very often we do not take all that is necessary into consideration when choosing an eating plan. It’s true that there’s a whole lot of Internet articles about what and how to eat. I think the basic is to eat in moderation. It also varies from one individual to another. Love the colours of your latke! I know it tastes just as good! Moderation is the most important aspect to me! The internet is wonderful, but then there are so many people saying different things it is hard to know who is right. For me the acceptable range of carbs is 45-65%. This is the range that is associated with reduced risk of chronic disease while providing the essential nutrients. I’ve seen some people that go crazy for low carb. We need at the bare minimum 130g per day to prevent ketosis. Some people look to go into ketosis, but the problem is it decreases the ph of our blood. I believe in balancing both starchy and non starchy carbs, with primary choices coming from fruit, non starchy veggies, whole grains, beans and legumes. I love your list and information Tandy! How confusing is the food pyramid these days, it changed so often I honestly have no clue how much of anything I am to eat. These Potato And Butternut Latkes look pretty delicious, they’d be a nice with some meat and herb salad, a big glass of vino would work a treat too. 🙂 That covers all the food pyramid right? Hi Tandy, I agree, everything in moderation. These look wonderful. Love the potato butternut squash combination. What a great, tasty breakfast! Wish I could pop on over for a taste right now. hehe. I so agree Tandy! There are plenty of healthy carbs out there! Hi! These sound lovely. I love anything that’s ‘fritter-y’ like this. Actually, as the veggies in these are grated, they remind me of a Swiss rosti, especially as you’ve added cheese. Beautiful! Would they go soggy then if you kept them for another day? These look beautiful and colourful. I also wouldn’t want to give up carbs but I do try to have mainly healthy ones. I do confess to being a bit of a carb addict 🙁 Love these latkes, they look so pretty too! Anything in moderation is good for you Tanya! Very nice idea for potato cakes…love the addition of butternut squash. Looking vey tasty and light. Love that color..
Hope you enjoy them Rachel!